One day, a man decided to build a trail. 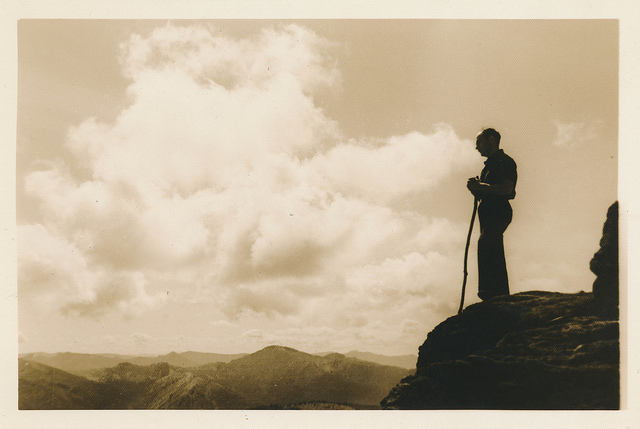 He had hiked the trails of others all his life. Now, it was his turn. He knew exactly the place: a yet-unmarked climb to a waterfall. He had been there many times, finding his way by landmark and deer trail. Now, he would share it with others by making a trail. The first day, he cleared brush and stones in the hot sun until his body ached. He went to bed exhausted but happy: he was building a trail. The next day, he ate his eggs in a rush, eager to hike the first leg of his new trail. Mere moments after he had begun, he reached the end: it was but a few yards long, still miles away from the waterfall. As he stared back at his trail’s short length, his heart sank. He stayed there a little while, listening to the jays, imagining the finished trail in all its glory, waiting for the disappointment to pass so he could go back to work. But the disappointment did not pass. His eagerness to build was gone. And so, in time, he turned around and went back to his truck, never to return. That’s how they like us: compliant, cheerful, walking their little paths. When you shuck your consumer skin and begin to create, do not be dismayed at the disorientation that follows. Everything you’ve done ‘till now has been through the mind, muscle, and bones of a consumer. You have a consumer’s sense of difficulty. You have a consumer’s sense of sacrifice. You have a consumer’s sense of TIMING. You’ve spilled your life’s blood for this project, and you see it now: you’ve only just begun. The consumer programming in you will quail and look for excusable exit. Turn a blind eye, a deaf ear. Feed the creator. Take whatever fumes of inspiration and hope you can find, gather them up into a ball of resolve, and press on. Yes, it will take months, years: everything you have. But that’s exactly the point. What else did you think your life was for? The hiker and the trail was an interesting read. While I was reading, I was guessing how it would end. To my surprise, it didn’t end as I had thought, the guy just quit, he never finished his trail. Now, I can relate to this on a metaphoric level, but also on a physical level, because I have made trails. Actual trails, in the woods. What is really awesome about that is, that I have hiked them, my father, my brothers, my mother, my kids, my sister, her family, all these people walk my trail. I can go on Google Earth, zoom in on my family’s property, and I can see my trail. Two miles of trail, hand cut through the thick northern Minnesota undergrowth. It’s there, I finished it. I made this trail, and I love it. As I read the article, as mentioned earlier, I had naturally assumed an end. My thought was that there was going to be regret, that the trail he built was used by hundreds of people, tramping up and down his trail, with out a single thought of who put the work in to build it, essentially taking it for granted. The fact that the trail I built is on our own private property guarantees that the only people who will be on this trail will be my family, people I love, and love me. They may not think about it every time they walk it, but they know who built it, and they certainly appreciate it. Building a trail is hard work, sometimes just getting fifty or one hundred feet is a back breaking day long struggle. I really enjoyed the article, and I know that I never want to be the guy who quits. I was not raised as a consumer, I was raised in the North Woods of Minnesota, everything we had, we worked for, everything we did, we did out of necessity. Northern Minnesota is an unforgiving, tough, extreme place to live, and living there simplistically, no running water, wood heat, animals to tend to, is one way to learn to be a man, a tough man who can take on anything, who can make it through anything. Bravo, sir! I applaud your writings and their messages.